Anders Olofsgård earned his Ph.D. in Economics, with specialization in political economy, development economics and applied microeconomic theory, from the Institute for International Economic Studies (IIES) at Stockholm University in 2001. His primary research areas are political economy, development and applied microeconomics, and he has published widely in both economics and political science journals. Before joining Stockholm Institute of Transition Economics, Stockholm School of Economics, he was working as Associate Professor at Edmund A. Walsh School of Foreign Service, Georgetown University, USA. Anders has also been a visiting scholar at the research department of the IMF, and done work for among others the World Bank, USAID and the Swedish Parliament. SITE was established in 1989, and has primarily become a leading research and policy center on transition in the former Soviet Union and Central and Eastern Europe. As part of that agenda, SITE has pioneered efforts to develop human capital within the region by building innovative, independent think tanks. More recently the institute has also broadened its geographical reach, and now produce research and policy advice that can benefit all emerging market economies, for wexample in South Asia. On 23 January 2013, the Swedish Research Council decided upon the 2012 applications for U-forsk grants for the perod 2013-15. U-forsk grants fund Swedish research of relevance to low and middle income countries, and were till 2011 distributed by the Swedish International Development Cooperation Agency Sida, but are now instead handled by the Swedish Research Council. Over the years, these u-forsk grants have been one of the most important ways of financing Swedish research projects related to developing countries, including South Asia. 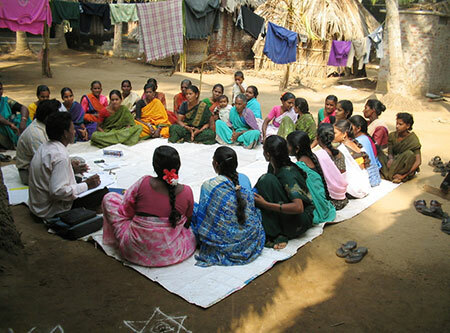 However, in the decisions of January 2013, only one South Asia related project was awarded a grant, and that was to Anders Olofsgård, Stockholm School of Economics for a project entitled ”Collective Action and Community Development: Evidence from Self-Help Groups in India”. The project was given SEK 3.2 m. for a three year period. See the full list of U-forsk grants, January 2013.
i. Household Surveys: We plan to conduct a follow-up survey of households in villages in Dungarpur district, Rajasthan—where the program examined in the first phase of this research was conducted. The main purpose of the second round survey is to capture more long term effects on the livelihood of group members. ii. Field Experiments: We wish to explore the internal dynamics of the groups themselves by conducting field experiments. Specifically, we wish to conduct a public goods game to identify the extent to which members cooperate with each other. A pilot of such an experiment was done in a small set of villages in the first phase, showing promising results. To generate statistically reliable results, however, a larger set of villages needs to be included. iii. Establishment of Monitoring and Information Systems (MIS): We wish to work with SEWA to develop a Monitoring Information System (MIS) by digitalizing log books from group meetings. This would make it possible to categorize better what information is shared, what priorities are expressed and what strategies are developed to jointly realize the group’s objectives. The establishment of this data-gathering system would open up many opportunities for future research on membership-based organizations and would also help SEWA improve its mechanisms of supporting these groups. PhD candidate Naonori Kusakabe is a Research Fellow at the Center for South Asian Studies at Gifu Women’s University in Japan. From the spring 2010, Mr. Kusakabe is affiliated to Stockholm School of Economics, and in particular its European Institute of Japanese Studies as a Visiiting researcher, first in Stockholm and then from July 2010 based at the University of Dhaka in Bangladesh. He is working on a comparative study of Swedish and Japanese Official Development Assistance (ODA) towards Bangladesh both now and in the past. Naonori Kusakabe is supervised in his thesis work by Prof. Marie Söderberg, Director for the European Institute of Japanese Studies. His research interests include Civil Society and NGOs, Development studies, Disaster management, and Climate Change. He has spent more than four years in Bangladesh, and in 2006 he wrote his Masters thesis as a student of Sophia University in Tokyo, on ”NGOs and Local People: A Case Study of Hatiya Island in Bangladesh”. It is available on the Internet, however in Japanese only. Go for the thesis. Till a few years ago, Professor Emeritus Jon Sigurdson worked as Director for the East Asia Science & Technology and Culture Programme at the Stockholm School of Economics. Earlier, during the period 1978–1996, he was Director for the Research Policy Institute, Lund University. 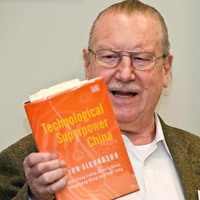 From 1995 till 2000, Sigurdson held the endowed ASTRA Professorship of East Asia Science & Technology and Culture at the Stockholm School of Economics, and between 2001 and 2003 he was Director for the Swedish School of Advanced Asia Pacific Studies (SSAAPS) – see information in the box. In 2001 the Swedish Foundation for International Cooperation in Research and Higher Education (STINT), and Riksbankens Jubileumsfond (RJ) decided on a five-year (2001-2006) joint graduate school initiative concerning Swedish research on Asia Pacific – SSAAPS, the Swedish School of Advanced Asia Pacific Studies. During this period SSAAPS financed post-doc positions, PhD-positions, workshops, publishing grants, visiting fellow grants and travel grants, amongst other things. The focus was entirely on East and South-East Asia, not involving South Asia. Professor Jon Sigurdson was the programme’s first coordinator up until 30 June 2003. After an initial phase STINT decided to continue SSAAPS for three more years, 2007-2009. SSAAPS was included in the European Alliance for Asian Studies, together with, among others, the School of Oriental and African Studies in London, Science-Po in Paris, the Dutch post-doctoral institute, International Institute of Asian Studies in Leiden and the German national institute for contemporary Asian studies, and Institut für Asienkunde in Hamburg. SSAAPS has contributed to the financing of the Alliance’s qualified Asia-Europe Workshop Series, in collaboration with the Asia-Europe Foundation (ASEF), whose largest contributor is the EU Commission. All activities within SSAAPS were phased out during 2010. As a researcher in science policy Jon Sigurdson developed special expertise in technology management at national and company level with a focus on areas such as: 1) Global structures for research and development (R&D) and their interaction with national systems for innovation; 2) Structural changes in the electronics and information technologies industries. Sigurdson held government posts in Swedish ministries of Foreign Affairs, Finance, and Industry before embarking on an academic career. Recent research focused on China as an emerging technological superpower. Even though Prof. Sigurdson’s research mainly focused on China, he has also made a number of comparative studies that included India. In 1997 he published an article together with the Dr. Prasada Reddy at Lund University’s Research Policy Institute entitled ”Strategic location of R&D and emerging patterns of globalization: the case of Astra Research Centre India” in the International Journal of Technology Management. The main objectives of the paper were to analyse the driving forces behind the move by transnational corporations (TNCs) to carry out some of their strategic R&D in some developing and East European countries. The results of the study indicate that the primary driving forces behind the emerging phenomenon are the companies’ efforts to gain access to scientific personnel as well as to reduce R&D costs. The companies involved are observed to be mostly those dealing with science-based technologies. More information about the article. In November 2006 Jon Sigurdson wrote a book entitled ”Kina och Indien – Sagan om de två giganterna (in Swedish: China and India – A tale of the two giants), that was published by the Swedish Institute of Foreign Affairs (Utrikespolitiska Institutet). Here, Sigurdson shows how both India and China started to open up their economies during the 1980s and 1990s, and especially China has managed to attract a large number of foreign companies. This has created a dependence on imported technology, and therefore both countries now strive to build up their own R&D. In this respect China is still far ahead of India, but many observers believe that India – because of its democratic system – finally will surpass China. The continued expansion of the Chinese and Indian economies will however most probably cause deep tensions in the rest of the World. In October 2002, Jon Sigurdson was invited as a Senior resource person to participate in SASNET’s Symposium for PhD candidates and post-docs in Marstrand, and present the programmes of SSAAPS. Read his presentation at the SASNET Symposium.